IDC forecasted that the wearables market will sustain a CAGR of 8.9% from 2019 to 2023 driven by a 10% CAGR in watches and a 12.3% CAGR in fitness bands. Watches are expected to grow from 90.6m in 2019 to 131.3m in 2023 and fitbands from 54.4m to 86.5m over the same period. The news is significant for Apple's as the iPhone has entered a period of (possibly secular) decline, as the product category reaches deeper into its mature lifecycle stage. 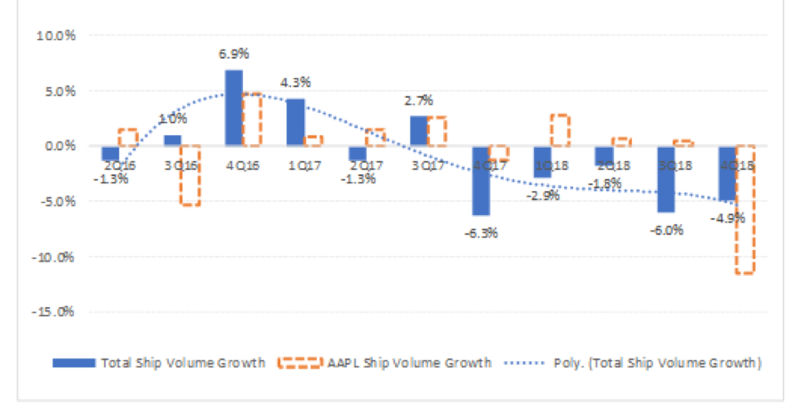 Apple has been suffering more than others in the recent few months, with iPhone softness having been the main culprit in the company's nearly disastrous fiscal 1Q19. The smart watch has expanded its utility to consumers as well as its addressable market by adding (1) cellular capabilities with the introduction of the Series 3 version and (2) health monitoring applications with the most recent Series 4 model. As device makers approach a ceiling in terms of how much innovation they can introduce in handheld devices, wearables could parallel the growth at scale that smartphones once did.